The not-so-new wing at Shangri-la Plaza has become home to many of Metro Manila's busiest restaurants. And while I still have a long way to go before I can finally shout "Huzzah! I've tried all of them," let me share with you one of my favorites among those I actually got to visit. It's an American comfort food haven interestingly named Kettle. Like a classic type of pot it was named after, Kettle holds different kinds of comfort food, one of which got two thumbs up (Might be more if they have extra thumbs!) from bloggers and foodies who've already been here. Actually, prior to this visit, I've already heard and read a great deal about Kettle. If you don't live under a rock, you might've actually seen netizens raving and posting photos of the resto's famous Buttermilk Fried Chicken. 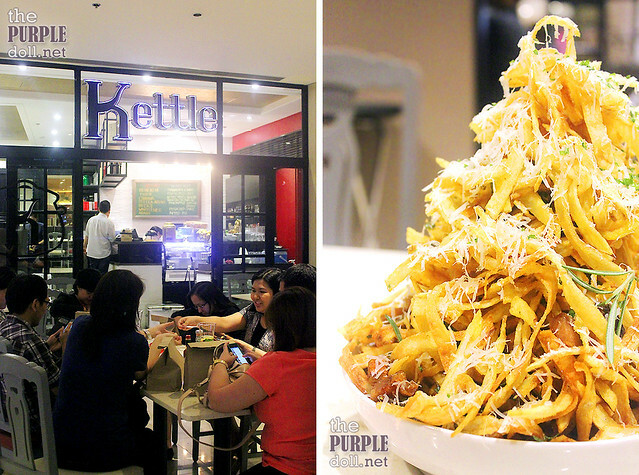 But after getting a real taste of Kettle, which kitchen is helmed by Chef Chiloy Santos, I learned that this restaurant is a great fried chicken spot and more. 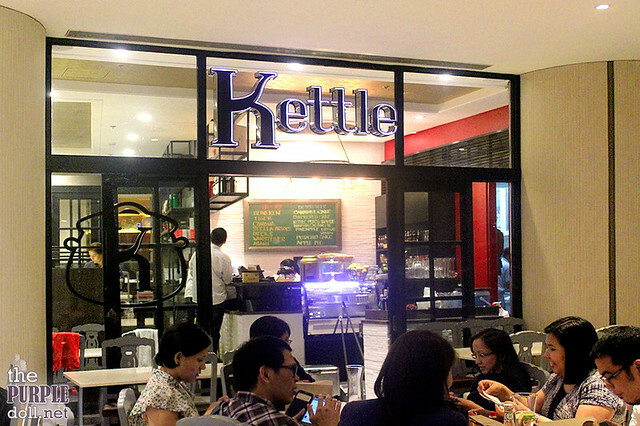 Located at Shangri-la East Wing's 5th level, Kettle is a pretty small restaurant with only 3 tables actually inside its doors and glass walls. It greatly makes use of the mall space though, with more seating in front and at the back of its enclosed area. But don't be fooled. Despite Kettle's simple and more straight-forward approach to interior, its food certainly does feel otherwise, with a kitchen churning out modern renditions of classics. To start off our comfort food binging session, we had the Pork and Potato Strips, a really tall stack of crunchy pork belly, fresh potato strips, cheese and fried herbs, served with red pepper aioli. Now, this is not for the faint of heart. Order this only if you're with company, or if you love chicharon and crispy thinly-sliced potatoes so much that you want to take home the leftover. Oh, if you're curious, our group of 8 can't even finish this! 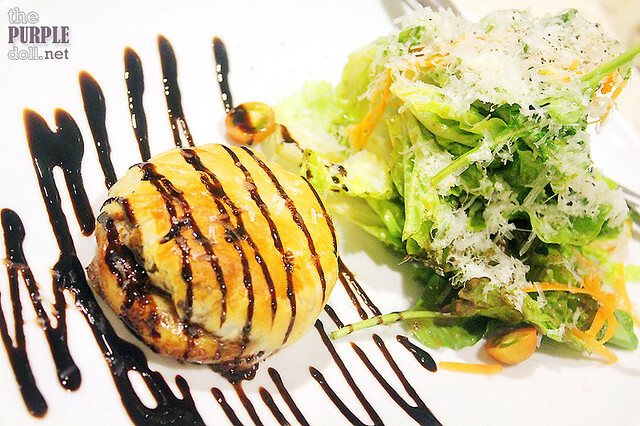 We also had this Baked Brie encased in puff pastry with forest berry jam, balsamic syrup and side salad. While I'm not the biggest fan of brie, I found this appetizer okay. However, I wish the cheese was creamier. That would've probably made me a convert. 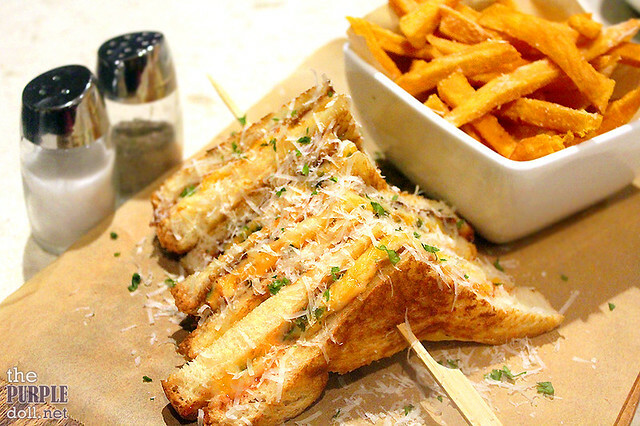 For something not-so heavy, there's the Kettle Grilled Four Cheese -- gruyere, fontina, cheddar and parmesan cheeses tucked in an English loaf with sweet tomato jam and basil, served with a siding of sweet potato fries. Despite how heavy it sounded, this a pretty light sandwich with a creamy, nicely balanced flavors. And while having an extra grilled taste would help, this is something I'll gladly order for merienda. 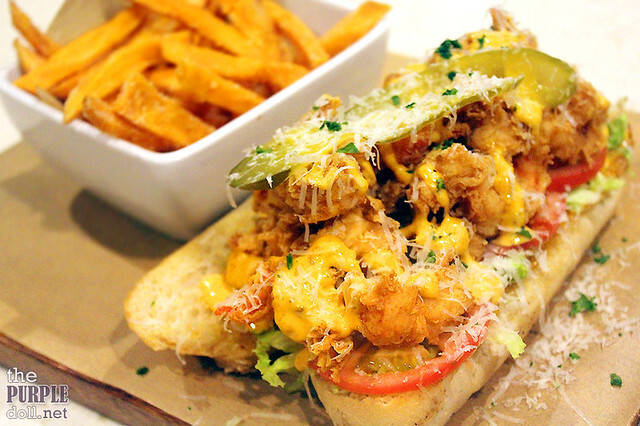 Another sandwich we had was the Shrimp Po'Boy -- cajun breaded shrimps with lettuce, tomatoes, pickles, emmental and remoulade on soft ciabatta roll. This is as simple and as straight-forward as this sub can get, and we liked it just the way it is. And like the other sandwich, it was also served with a siding of sweet potato fries. The main attraction for the night was this Buttermilk Fried Chicken a lot of foodies are raving about. It was marinated in buttermilk for 24 hours, then battered up and fried Southern-style and finally, served with addicting-ly good honey-glazed cornbread, along with country gravy and cajun honey. 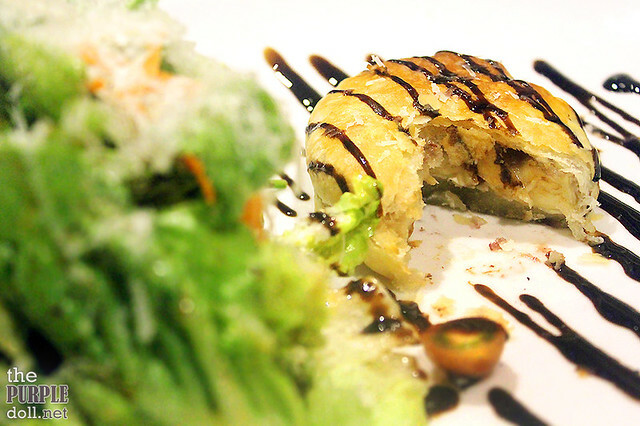 Although this dish seems so simple, every bite just leaves you with a happy feeling. Now I know why this was so hyped up! It's just that good. 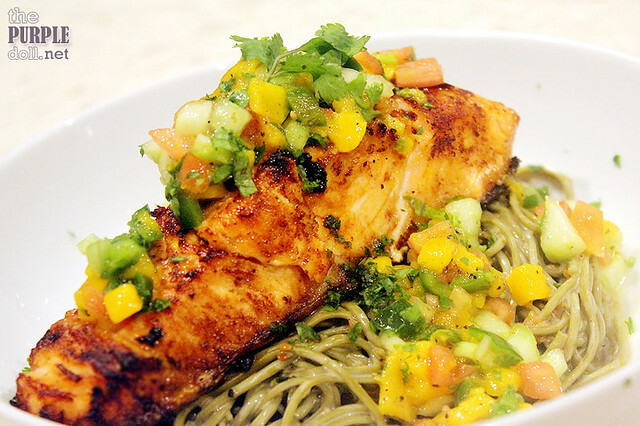 Another good find was the Miso Glazed Salmon -- pan-fried Norwegian salmon and mango-cilantro salsa over a bowl of cold wasabi-infused soba noodles. This may seem another simple dish, but it has every element I love combined to make a medley of subtle but beautifully refreshing flavors. And nope, I don't need to go into any healthy diets to start incorporating this to my meals. I'll gladly have this any chance I can! 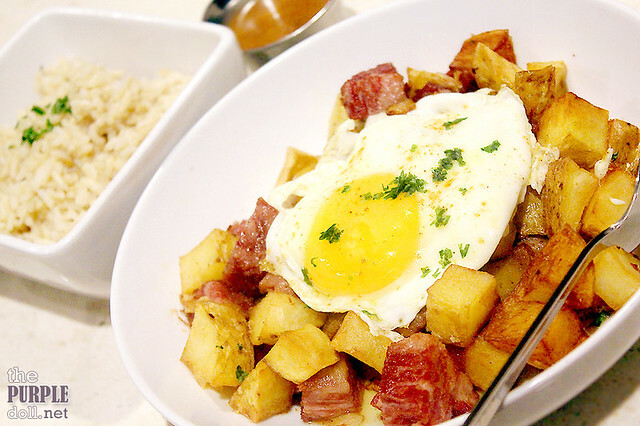 Last among our mains was this Corned Beef Hash -- Kettle's succulent house-made corned beef and fried potato cubes topped with a sunny-side up egg, and served with gravy and a choice of either rice (white or brown) or toasted bread. When this was first brought to our table, I already had my eyes on the prize! I love meaty, juicy and flavorful corned beef. I love any-way potatoes. I love sunny eggs. 'Nuff said! 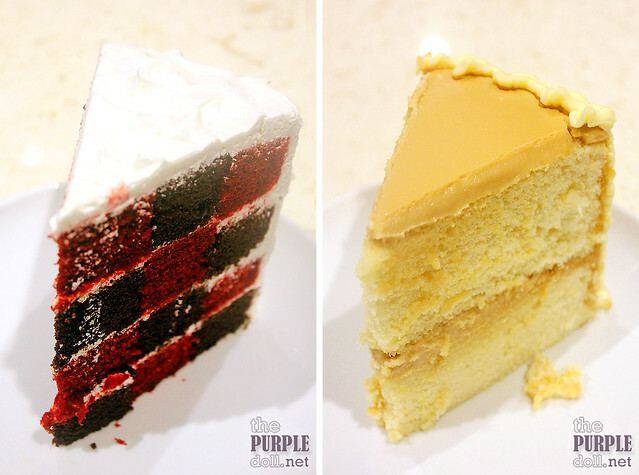 For desserts, we started with the Checkered Cake -- a really eye-catching cake with alternating layers of chocolate and red velvet chiffon. I'm not a big fan of chiffon, so I didn't quite dig this slice. However, I definitely give it an A for presentation. I'm no baker, but I can imagine just how much effort was put to assemble this. We also had a slice of Caramel Cake -- a light, soft and fluffy chiffon with caramel frosting. While I'm not much into chiffon cakes, I liked how this slice had just the right amount of caramel sweetness. It'd pair really well with coffee too. Throw in fruits into cakes, and you have my attention. 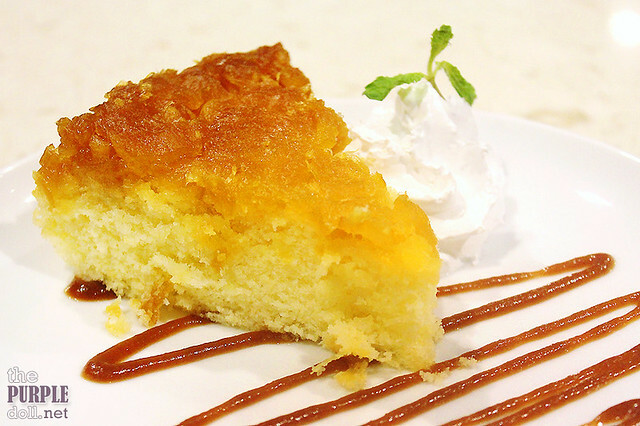 And that's exactly the case with this beautiful Pineapple Upside Down Cake. The light and airy pineapple-infused chiffon layer might not have totally enticed me, but the crystallized pineapple on top definitely got me hooked. And together, I loved every bite, which had just the right level sweetness. We also had this serving of Banana Cream Pie which taste reminded me so much of banoffee, just with a whole less toffee. Banoffee pie lovers would dig this seemingly deconstructed version of a banoffee pie. On the other hand, I found it just okay. 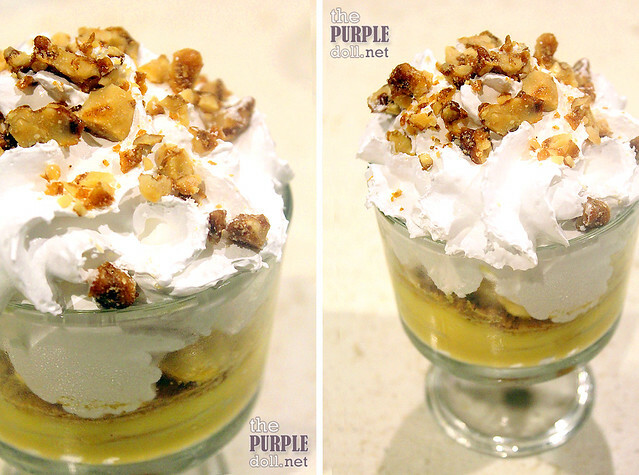 I love fruits, cream and nuts when it comes to desserts, so it was a no-brainer that I'd succumb into the temptations of this serving of Peach Trifle. It had layers of soaked spongecake, pudding, cream, peaches, nuts and even some blueberry preserve. American cuisine is something I don't necessarily go to when in need of comfort food. However, Kettle does its food so well, that whatever item they churn out from the kitchen, I'm positive I'd see it as a source of comfort. Whether it be a modern interpretation of an American classic, or just a simple, straight-forward rendition, Kettle sure knows what it's doing. Everything we had that night was at least good, with some items really standing out. And while prices veer more on the steeper side of the spectrum, I'd say the flavor, quality and even portion sizes justify the tags. 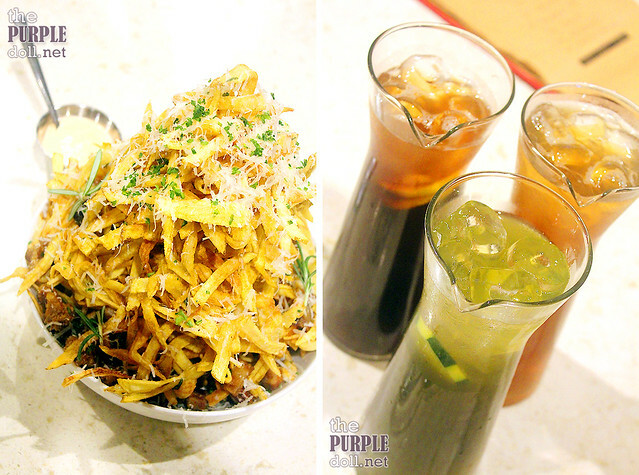 So if you feel like indulging in good comfort food, consider Kettle. It's a place definitely worth checking out and coming back to. I'm from the US and I've actually never heard of Kettle before. It's interesting to see how American food is perceived in other countries. All of those sound and look really amazing though...Now I wanna find a Kettle somewhere here--especially for those pork and potato strips and baked brie omg. Your rating is almost perfect. How I wish I could visit this place too and prove its seeming perfect service. 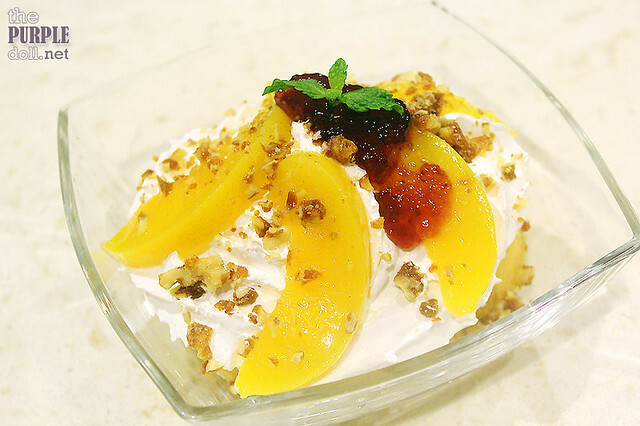 By the way, what attracts me better is the Peach Trifle which looks so tasty, yummy. I think we all need to spend from time to time just to be in touch with the finer side of life and there are places like kettle that backs it up with great taste and service. The family has long been planning to eat here. For some odd reason, lage hindi natutuloy. =)) Noting your suggestions para pag natuloy na haha. My eyes feasted on the desserts. The place is far from where I live. Kahit na mag crave ako today napaka impossible na maka bile kami. Hope they will open a branch here sa Fairview Terraces. I super loved the Buttermilk Fried Chicken and would come back just to eat that!! :) I loved the honey sauce ha.. Went very well with the crispy fried chicken!! :) Was disappointed though with the corned hash because after a few bites - it became nakakasawa but nonetheless - I would definitely go back to the Buttermilk Fried Chicken!! Hope to bump into you soooooooon!! Cheeese 😍 ! It always taste great when there is cheese hahahaha!